For the ultimate traveler there's the ultralight ZenBook 13, and a larger screen in a compact chassis, there is a ZenBook 14. And the all-powerful ZenBook 15 is for you if you need an extra boost for graphic performance. Pick your creative partner today! Designed to give you the most screen area in the least physical space, the new frameless four-sided NanoEdge design of ZenBook 13/14/15 are simply breathtaking: it makes any visuals more immersive, with less distraction for your eyes. The ultra slim bezels are just 3mm thin on the sides, and still save enough space on the top to accommodate the camera. With this ultra-compact display, you can see more but carry less. Creativity demands a great screen, so ZenBook 13/14/15 each has high-resolution FHD display that's beautifully crisp and clear, with wide viewing angles and vivid accurate colors that give you an ultra-realistic viewing experience for movies, photos and games. It also features exclusive ASUS technologies – including ASUS Splendid and ASUS Tru2Life Video – that fine-tune display parameters to ensure optimum eye comfort and color performance, for any kind of content. With any ZenBook, your comfort is one of our top priorities. ZenBook 13/14/15 goes the extra mile with its exclusive ErgoLift hinge, an engineering masterpiece designed to automatically tilt the keyboard to the most comfortable typing position. But that's not all: the carefully calculated tilt improves cooling and audio performance, too. Designed to empower your creativity, ZenBook 15 doesn't sacrifice performance for size. It's built to give you all the raw power you need for effortless on-the-go computing. Featuring the latest Intel® Core™ processors, up to NVIDIA® GTX 1050 Max Q, and packed with high-quality, high-performance components, ZenBook 15 will never keep you waiting. Whether you're creating complex documents, mining data, retouching photos, or simply taking a gaming break, ZenBook 15 let you do more – and do it quicker. ZenBook 13/14/15 are powered by a high-capacity battery that won't let you down, no matter how long and demanding your day is. Extended journeys or day-long meetings are no problem for ZenBook 13/14/15, even when power outlets are in short supply! The new ZenBook series is also equipped with gigabit-class Wi-Fi and ASUS Wi-Fi Master technology, so you can enjoy fast downloads and smooth streaming with greater range² and more stable network connections. For easy productivity on the go, ZenBook 13/14/15 is equipped with full-size backlit keyboard that delivers a superb typing experience. It's masterpiece of ergonomics, with just the right amount of key travel. And of course, the ErgoLift hinge ensures it's always titled at the perfect angle for comfort. 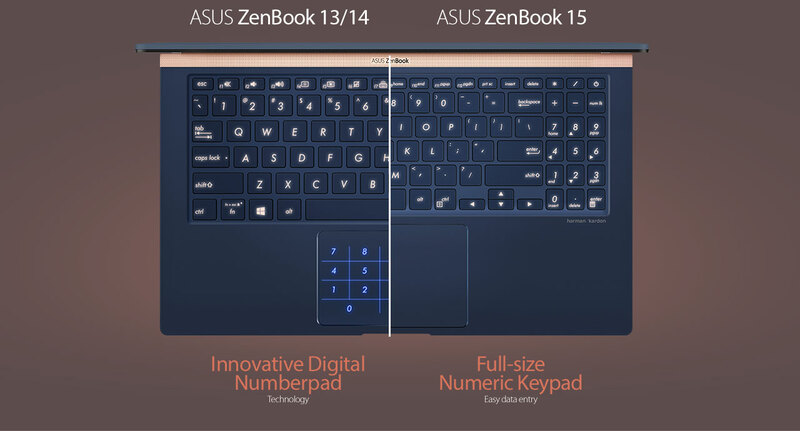 And even though it's compact, ZenBook 15 features a standard full-size numeric keypad for speedy data entry while ZenBook 13/14 introduces the exclusive new NumberPad, a touchpad with a switchable numeric keypad for speedy data entry. ZenBook 13/14/15 and Windows 10 put you in total control of your laptop – without lifting a finger. The advanced hardware works seamlessly with Windows Hello and Cortana, so you can wake up your laptop and login by using just your face, and command with your voice. ZenBook 13/14/15 meets the ultra-demanding MIL-STD-810G military standard for reliability and durability, undergoing a punishing test regime that includes extended tests for operation in harsh environments including extreme altitudes, temperatures and humidity. It has also passed ASUS internal laptop tests that far exceed the standards set by the industry. © 2018 ASUS Computer International. All specifications and terms are subject to change without notice. Please check with your supplier for exact offers on selected models. Products may not be available in all markets. Product may not be exactly as shown in photos. Brand and product names mentioned are trademarks of their respective companies. ASUS shall not be liable for technical or editorial errors or omissions contains herein. Ultrabook, Celeron, Celeron Inside, Core Inside, Intel, Intel logo, Intel Atom, Intel Atom Inside, Intel Core, Intel Inside, Intel Inside logo, Intel vPro, Itanium, Itanium Inside, Pentium, Pentium Inside, vPro Inside, Xeon, Xeon Phi, Xeon Inside, and Intel Optane are trademarks of Intel Corporation or its subsidiaries in the U.S. and/or other counters. 1. ZenBook 15's 15hr battery life is testing with Intel® Core™ i7-8565U, 16GB RAM, Full HD display, 512GB PCIe SSD. Battery tests conducted by ASUS in September 2018 using the MobileMark® 2014 Office Productivity scenario. 2. Test settings Wi-Fi enabled, display brightness set to 75%. Actual battery life may vary depending on product configuration, usage, operational conditions and power management settings. Battery life will decrease over the lifetime of the battery. For Wi-Fi range, please learn more on ASUS website for more details.